Know the goal of the website before you get started with the project. This rule is listed first for a reason. It is very important to know where you would like to go or what you would like to do before you put out any money to get something done. It may seem like a no-brainer, but people sometimes jump into building an affordable website without any idea of what to do. When this step is skipped, there isn’t a focus and clients tend to get a little of everything and often not in the areas that they had expected. This step is crucial when trying to keep within the boundaries of an affordable website design. Building an affordable website design can take time. Put less focus on the overall design and make sure the usability of the website is clear. When building an affordable website design, it is important to focus on providing easy ways for the customer to get the information they want. The design of your website doesn’t have to be revolutionary. We have seen websites that offer “cutting edge” design, but when it is placed in front of users they get confused and leave to find the information they were looking for on a competitor’s website. Most of the time in business, your customers don’t care about how fancy your website is, they want to know what you can do for them. Information that is readily available and easy to read helps them with their decision making process. Help your affordable website design grow by including it in your other advertising. This is one area where you can help, that not every business takes advantage of. It seems like a no-brainer, but some businesses do not put their website address on their other marketing items. We see this as a huge waste of such a valuable resource. It is similar to shutting the door in the face of a person who wants to do business with you and then sitting down and wondering why your business is struggling. It takes very little effort to include a website address on all your marketing materials for your business and it helps tremendously. An affordable website design can help convert traffic from your other marketing activities to your front door. Talk with your professional website designer to see what options might be available for you. When you deal with a professional web site designer, they know what certain items and features cost and can make suggestions of what is possible within a certain budget. 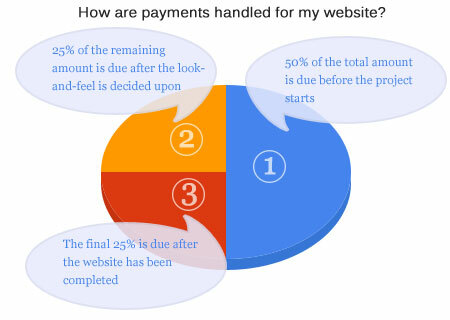 This can be a very useful tool when trying to build an affordable website design. It is best to know what options are available to you so you can make the best decision when utilizing your resources. In conclusion, keep these 5 factors in mind when building an affordable website design. Know the goal of the project. Realizing that the project will take time to complete. Focus on usability for your customer. Include the website address in your other advertising and keep the lines of communication open with your website designer. These factors will help guide the project and make sure that it gets done effectively, efficiently, on time and on budget.